I got started with these web pages back in a day when I spent a lot of time playing Go online. People often asked questions that were just too hard to answer in a "chat" session. That is why I put together some thoughts for beginners, and people who have played a few games but who are getting frustrated. When I started these pages, Yahoo hosted Go games and had a link to the rules, but those pages stressed capture so much that I felt something else was needed. They later changed those pages, and the latest versions were much better, but by then it was too late... I had already begun. Now, I fear, they are out of the Go business altogether. In the box on the right are some of the questions that I have encountered, together with some links others have found useful. You can go straight to a section that interests you, or continue to read this page. 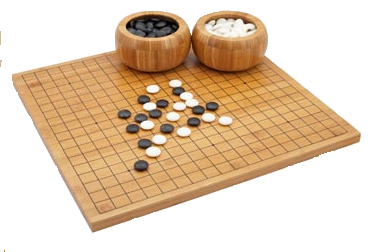 The object of a Go game is NOT to surround and capture the opponent's stones. So, what is the REAL object of the game? 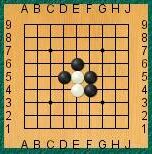 You have probably heard this before, and maybe lost sight of it, but here it is: the object of the game is to surround empty territory on the board. You do this by building "walls" around empty intersections. If your territory includes some opposing stones, so much the better. But think about territory rather than capture. Look at the picture on the left. 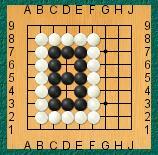 It shows the position at the end of a short Go game played on a 9x9 board. Let us assume there were no captures during the game. 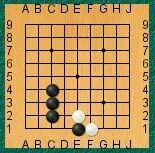 Black now has one territory with 14 empty points (intersections, or crosses) inside it. 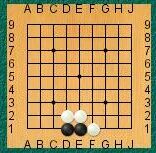 White has two territories: the one on the right has 6 empty points and the one on the left has 11 empty points. So the final score is Black:14, White:17. White wins the game by 3 points. This isn't just an arbitrary rule. There is a good reason why territory is better than captures: it's worth more points. Read on to see why that is. Why are territory points better than capture points? When you come to add up the points, we know you get a point for every empty intersection within your walls, and you get a point for each stone you capture. So why is one kind of point better than another? Take a look at this diagram (Diagram 2a). 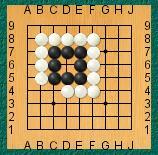 White has just captured one stone at B8. It took four moves to do it. 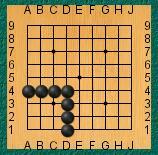 In the meantime, Black used her four moves to build a wall. OK, admittedly, it's not a complete wall, but it's a solid framework that can become a wall if White tries to cause trouble in that area. 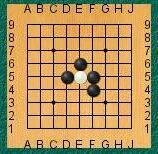 Similarly, White has two points of territory, but will also probably get the points at C9 and A7, if we give her the benefit of the doubt. Of course, this may be a very artificial situation, but you might see that the area each side controls is something like the points marked with 'w' or 'b'. 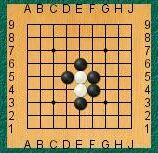 that gives Black 13 points, versus 4 points of territory and one capture - 5 points - for White. 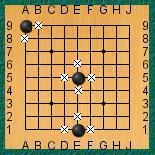 Black's plays were more efficient than White's because Black went after territory rather than capture. Why do I keep getting captured? There is a very simple answer to this: because your stones run out of liberties. A liberty (sometimes called a freedom") is an empty point next to your stone or stones, and diagonals do not count. For the mathematically inclined, a liberty can be defined as 'an empty orthogonally adjacent intersection'. 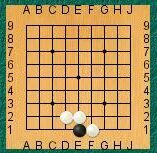 One stone by itself in the middle of the board has four liberties: if it is on the side,it has only 3, and in the corner, it has only two. In the Diagram 3, the liberties are marked 'X'. 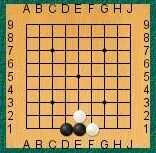 A fundamental rule of the game is that a stone, or group of stones, must have at least one liberty or it may be removed from the board. The important thing to keep in mind is that, if your stones are being attacked and you are trying to make then run away, make sure you are doing so in a way that will eventually increase your liberties. 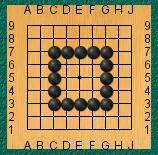 If you try to run away by playing as in Diagram 4a, there will then be two stones, but still only one liberty (at C1) and White can capture by removing the last liberty, as in Diagram 4b. Diagram 5 below is similar. 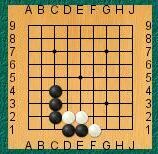 Here if Black tries to run out as in 4a, he can get more liberties - temporarily - but White can continue to reduce them until Black comes to the edge of the board, where he is captured. After Black's move (Diagram 5a) the two black stones have 2 liberties, but when White plays as in Diagram 5b, there is only one again. 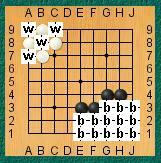 And White will continue to play on top of the black stones if Black tries to run out again. 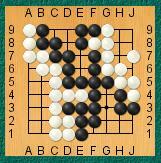 Eventually, when Black comes to the edge of the board, there are no more liberties and the black stones die. Of course the situation is different if there are friendly stones in the area. Look at Diagrams 6-6c. 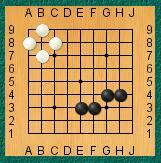 Now in the end, the black stones run towards another black group that has plenty of liberties (8). 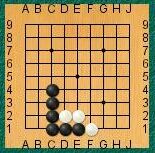 White's attack leads to Black connecting up with a "safe" group of stones. 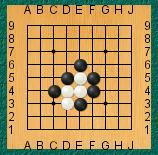 A ladder (also called shi-cho) is a situation very much like the last in which one player can attack a group by repeatedly reducing the liberties to one with attacks from different sides. Nothing explains it as well as a series of diagrams. 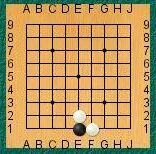 And so on, until we reach the edge of the board and White runs out of liberties and is captured. 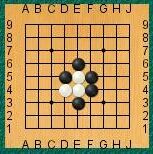 The interesting thing is that the black stones have a lot of diagonal weaknesses, and if the white stones could get away - perhaps by connecting with a friendly stone in the ladder's path - Black would have a lot of cutting points to worry about. What is most important about a ladder is recognizing that one can develop; i.e. 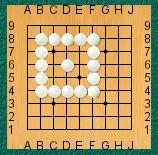 you can see from the first Diagram 7, that a ladder can develop and the white stone is lost. Once you start a losing ladder fight, you might as well resign because it will be too hard to regain the eventual loss. You can see why it's called a ladder, from the shape the stones form, although perhaps it's more like a staircase. 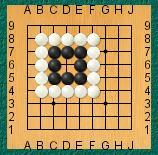 You may see players tracing out the zig-zag o the board with their fingers, to see where it will end up. 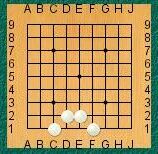 It's not comsidered very polite, but if you are a beginner, and you ask your opponent whether she or she minds, go ahead. Eventually you will be abe to see the path in your head. What is important about "2 eyes?" 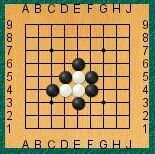 One of the rules of Go says that you can only play on a point if it is empty, and if after the end of that move the stone placed has at least one liberty. Look at Diagram 8. 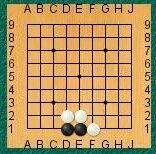 White can now play in there, because the move captures 8 black stones, and the last white stone played now has four liberties. So how can a group become unconditionally safe? If it has two separate interior areas (called "eyes") it can never be captured. Diagram 8c shows a very small safe black territory. 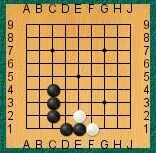 White cannot play into either eye, because doing so would leave the played stone without liberties - an illegal move. By the way, don't think that an eye is the same as one empty point That is just the smallest possible eye, and you will commonly see eyes of two or more adjacent intersections. Remember that an eye is an independent interior area of a group. Why does play start near the corners? 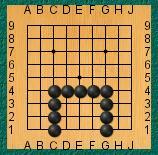 You can see that it took 16 stones to surround 9 points in the middle of the board. Diagram 9a shows only 11 are required at the edge of the board, and Diagram 9b shows 7 stones enclosing the same number of points. So it is a matter of efficiency: territory just requires a smaller investment of stones near the corners. What is so important about "2 eyes?" How do I know when the game is over? What are kyu and dan ratings? Who is Tel and why should I care what he thinks?